https://matcha-jp.com/en/6830 Star In Your Own Video In Japan - Capture Your Trip Memories On Film! Remember your travels in Japan with a beautifully-filmed video! Kurosawa-san, a videographer fluent in English and Korean, makes films for international visitors. Record the special moments of your trip and play the lead in your own short film. You can have a special record of your travel in Japan with a stunning video where you're the star. If this is an experience you want, there's a service offering videos that can be made personally for you. The videographer is a professional, so if you want to star in your own movie or want to have a high-quality video to remember your trip by, give this a try! We accompanied videographer Yosuke Kurosawa on one of his filmings and interviewed him about what he does. Kurosawa-san is based mainly in the Kansai, a region that includes Osaka and Kyoto. 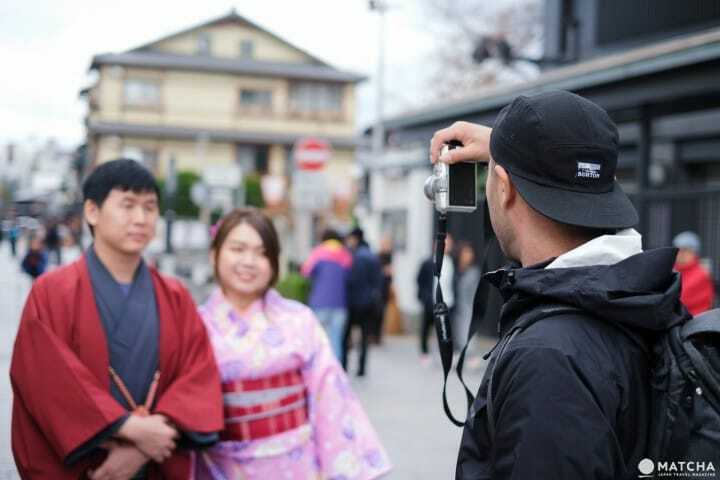 He offers his service to visitors to Japan, and is also often asked by domestic and international clients to produce video content and films for them. Kurosawa-san lived abroad in Canada for three years and in Korea for two years, and can therefore speak fluent English and Korean. He is also currently studying Mandarin. Visitors who don't speak Japanese will be able to smoothly communicate with him. When we visited, Kurosawa-san had made around 100 travel videos for visitors to Japan. All his customers have expressed high levels of satisfaction. He also includes scenes with the local streetscapes and buildings, so when you watch the video you can more clearly recall your experience. We visited one of Kurosawa-san's filming spots to watch his work. Below is the entire process of the filmmaking, from meeting clients to shooting the video. First, decide the meeting time and place with some initial messages. The filming location for today is Kyoto. Kurosawa-san adjusted the time to accommodate the customers’ kimono rental. Kurosawa-san features some of his own video content on his social media accounts, so you can get a general idea about his work and himself ahead of time. Meeting spots will be easy to find. During our visit we had a smooth meetup with the customers. After introductions, Kurosawa-san will explain how he would like you to move around, walk, and behave in the film. With his fluent English and helpful hand gestures, it is easy to understand what he has in mind for your video. For couples, Kurosawa-san tries to capture scenes that will convey happiness. For solo travelers, he focuses on emotions like excitement and uncertainty to emphasize the new experience. Kurosawa-san will adjust his filming process to accommodate families and groups of friends, too. Also, feel free to ask if you have a special request for Kurosawa-san. He'll be more than happy to take your request into consideration when making your video. Kurosawa-san will also suggest a filming route to you, but don’t hesitate to ask if you have a different area in mind. Don't worry about him suddenly starting to film without giving warning. Before beginning, he explains in English, or in your preferred language, what type of video he has in mind and the kinds of images he wants to shoot. With a complete understanding of the recording process, Kurosawa-san’s clients will feel relaxed and calm. The filming begins once the explanations are over! Kurosawa-san first attaches special accessories and devices to his camera to take in-focus shots. This also ensures that the shots are high-quality and cinematic, portraying you as the hero or heroine of a major production. Videos can be filmed at Kurosawa-san's recommended quiet streets, where there are few people. These shots of you exploring spots with a classic Japanese feel will provide lasting memories of your trip. Of course, filming can also be done in more crowded, bustling areas as well. The other travelers and people who unintentionally make appearances in your story will make the scenes more travel-like. Kurosawa-san will capture you from different directions and heights, including low angle shots, to make the video more interesting and appealing. The accessories on his camera are compact, allowing him to shoot even in crowded areas. You’ll be thrilled with the high quality of the video when you see it for the first time! You can also do sightseeing during the filming. For example, when picking omikuji at a shrine, Kurosawa-san will explain to you what's written in Japanese. This service provides you with a video and also a chance to learn about Japanese culture! Kurosawa-san says when filming, he first asks his clients to give a more natural expression, and after that, they usually begin to develop confidence in front of the camera. At first, the couple pictured above was a little nervous, but Kurosawa-san was able to capture when they relaxed and started smiling more. The filming ends after one and half to two hours. The customers and Kurosawa-san expressed their thanks and appreciation by exchanging handshakes. The video is edited into a three-minute version and a shorter one-minute version. Customers will receive the finished product within three days. Kurosawa-san travels overseas on a regular basis. Seeing something that depicts everyday life in the country he's visiting is the most enjoyable part of traveling for him. He wants international visitors to see and enjoy everyday life in Japan. "For example, when you have a meal in Ura Namba (*1), play smartball at an arcade in Shinsekai, stay overnight in an apartment, or walk through Tenjinbashi-Suji Shopping Street, you'll begin to feel what daily life is like here and have a more interesting experience. I also recommend riding the local trains and buses to see people going about their lives. From the windows of streetcars and buses you can get a view of the city, and in this sense it will be more interesting than taking the subway. Please give it a try!" Kurosawa-san also told us that he first started because he wanted to show visitors Japan's local sights. *1 Ura Namba: the area stretching from Namba Station to Nipponbashi Station in Osaka City. "When I was in Taiwan, I rented a bicycle through a bike-sharing service. Due to this experience, I recommend that visitors in Japan also rent a bike so that they can explore every corner of the area they're in." While interacting with internationally-minded Kurosawa-san, we could feel his passion for helping travelers have as much fun in Japan as he does during his own overseas travel. For information and to make a booking for Kurosawa-san's service, please click here. Kurosawa-san’s service covers the Kansai Region and Tokyo, but he is sometimes able to accommodate filming in other areas, too. He charges 12,000 yen and up per person for his video making. The video he created during our visit and interview can be seen below. Try this service and have your wonderful memories of visiting Japan captured on video! Kyoto Sightseeing Guide - Don't Miss On These Must-Visit Places!